In a bid to move driverless car technology one step closer, Jaguar Land Rover have been taking part in the UK’s first tests of autonomous and connected cars on public roads. Taking place in Jaguar Land Rover’s home of Coventry, the tests saw a group of autonomous and connected cars navigating the city centre by themselves – of course, in real-world tests such as these, each car had a safety driver behind the wheel to take over whenever necessary. The tests come as part of the Government-backed £20m UK Autodrive project that aims to increase the use of autonomous cars by 2020. This project has become even more prevalent in recent weeks due to the Government announcing in their Autumn Budget that they aim “to see fully self-driving cars, without a human operator, on UK roads by 2021”. Jaguar Land Rover are testing two different types of technology that will benefit drivers in slightly different ways; these two technologies are autonomous and connected. The main difference between the two is that autonomous cars allow for entirely driverless transport whilst connected cars are mainly driven by a human but have the ability to talk to one another, connected traffic lights and other such technologies to ensure increased levels of hazard avoidance and subsequently safer roads for everyone. 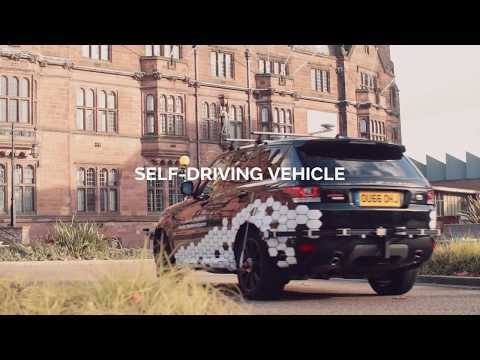 Until now, Jaguar Land Rover’s research into autonomous and connected technologies has been confined to controlled areas of testing that allow all aspects of the situation to be monitored closely and perfectly predicted. Real-world tests have allowed the teams to put their technology up against entirely uncontrolled situations and unpredictable elements such as pedestrians. “Testing this self-driving project on public roads is so exciting, as the complexity of the environment allows us to find robust ways to increase road safety in the future. By using inputs from multiple sensors, and finding intelligent ways to process this data, we are gaining accurate technical insight to pioneer the automotive application of these technologies”. With a target of making the UK a global hub for the research, development and integration of autonomous and connected technologies, the UK Autodrive project will continue trials into 2018. The Government now focussing heavily on new driving technologies (an industry expected to be worth around £900 billion worldwide by 2025) tests like the aforementioned are likely to become more and more common. What are your thoughts on future technologies like autonomous and connected cars? We’d like to hear your opinion on Facebook, Twitter or Linkedin. New Autonomous Concept demonstrates the Jaguar of 2040.